An ensemble of different meeting tables that is suitable for use in all zones and areas of the office where communication takes place – above all in meeting and conference areas. In different sizes and heights, with different tabletop and frame designs, in a variety of colours and materials. Ranging from small meeting tables to upright tables and multi-part conference tables with integrated media technology. The design of T-Meeting is striking, minimalist and high-grade. It can be used in all communication zones and areas: at the workplace, as a meeting and conference table, in lounge areas, recreational and central areas, or in the cafeteria. Frame variants: O-leg, 4-leg, A-leg, T-leg, slab-end, column leg and slope. 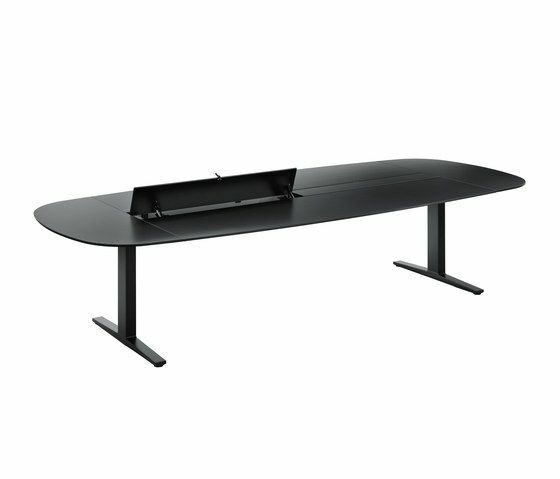 Tabletop shapes: oval, boat-shaped, rectangular multipart meeting tables optionally with cable flap or sliding top. Optional professional and comprehensive media integration (Bene MediaRoom). Access to VGA, network and power connections is provided via aluminium cable flaps. Can also be furnished with a projector box. Cables are managed by means of cable trays and chains.